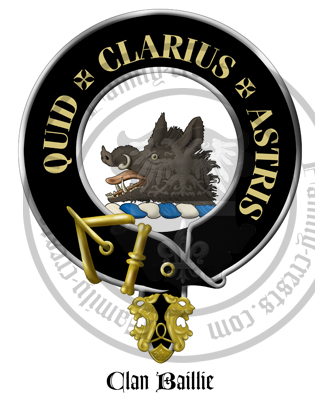 Motto: Quid clarius astris (What is brighter than the stars?). The most likely derivation of this name is from the French ‘baillie’, meaning ‘bailiff or ‘steward’. One of the earliest records of the name appears in 1311 when William de Baillie appears as juror in a case concerning land in Lothian. Nisbet records that the Baillies of Lamington were truly a branch of the great house of Balliol, Lords of Galloway and sometime kings of Scots. William Baillie of Hoprig was knighted by David 11 in 1357 and received a royal charter to the barony of Lamington in 1368. Alexander Baillie, a younger son of Lamington, fought at the Battle of Brechin in 1452 and was rewarded by the Earl of Huntly with the lands of Dunain and Dochfour near Inverness. Tie was also appointed constable of Inverness Castle.Cuthbert Baillie of Carphin was Lord High Treasurer to James IV in 1512. Sir William Baillie of Provand was called to the Bench in 1566, taking the title of ‘Lord Provand’.Sir William Baillie married Janet Hamilton, daughter of James, Earl of Arran and Duke of Chatelherault. He was made Master of the Wardrobe to Queen Mar in 1542. Faithful to her daughter, Mary, Queen of Scots, they fought at the Battle of Langside in 1568, after which the estates were declared forfeit. The Reverend Robert Baillie, descended from the house of Jerviston, was a renowned Protestant minister and chaplain to the Covenanter armies in 1639. Baillie had no connection with any conspiracy to overthrow the government but he was nevertheless arrested and charged with conspiracy to commit high treason. He was convicted in the High Court at Edinburgh on 24 December 1684 and sentenced to be hanged the same day.In 1894, James Evan Baillie of Dochfour married the daughter of the first Baron Burton. the great Victorian industrialist. Lord Burton died without male issue and the peerage has now passed to the Baillies of Dochfour, who still have a great estate on the shores of Loch Ness.